Written for Interactions magazine by Hugh Dubberly and Shelley Evenson. In this article, we contrast the “sales cycle” and related models with the “experience cycle” model. The sales cycle model is a traditional tool in business. The sales cycle frames the producer-customer relationship from the producer’s point of view and aims to funnel potential customers to a transaction. The experience cycle is a new tool, synthesizing and giving form to a broader, more holistic approach being taken by growing numbers of designers, brand experts, and marketers. 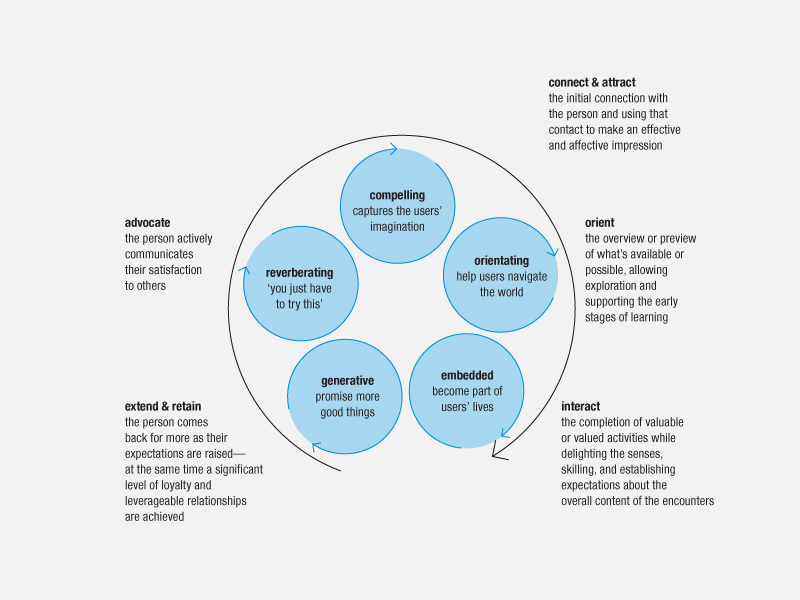 The experience cycle frames the producer-customer relationship from the customer’s point of view and aims to move well beyond a single transaction to establish a relationship between producer and customer and foster an on-going conversation. We acknowledge the sales cycle model has value. And designers need to be familiar with it. 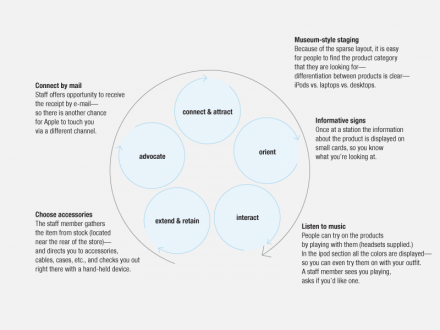 But when the sales cycle comes up as a topic of discussion in a client engagement, designers should also think of the experience cycle as an alternative frame—and should introduce it into the discussion. We believe the experience cycle is a more useful model not only for designers but also for marketing and sales people, because it is more likely to lead to an experience of lasting value for customers, and thus greater long-term value for producers. The “sales cycle” is a model commonly used in business. It often frames the basic structure of marketing and sales activities, providing a practical template for planning. 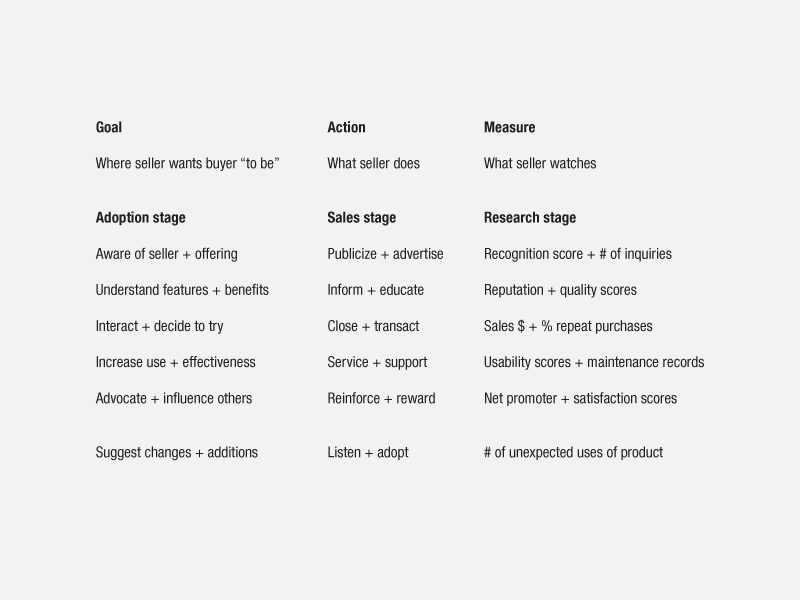 The sales cycle describes the series of steps leading to a sale (or purchase), including awareness, consideration, and selection. The goal is to push customers to buy—advertising to increase familiarity, informing to build knowledge, offering incentives to close a deal. The sales cycle also refers to the time required to complete the sales process. The length of the sales cycle varies depending on the cost, complexity, and context of use of the product being sold. For example, a hospital information system might have a three-year sales cycle; a new game console might have a sales cycle lasting a few days or weeks. The sales cycle does not have a single, canonical form. Many variations appear in the literature, and in practice people often tailor the model adding or subtracting steps to fit their own situations. 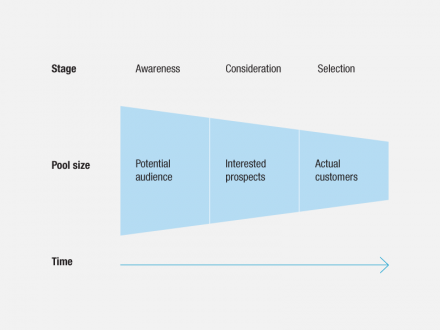 A common characteristic of sales cycle models is the funnel shape, a visual analogy to a process that begins with a large pool of candidates, narrows to a group of interested prospects, and narrows again to those who purchase. The funnel model is useful in managing a “sales pipeline.” Defining a series of steps in the sales process creates opportunities for setting goals, tracking performance, and analyzing effectiveness, which makes forecasting more reliable and enables improvement of the process. 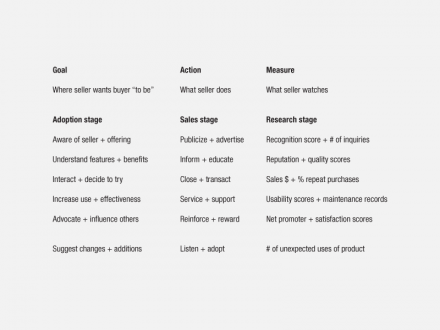 This model updates the sales cycle, framing stages in the process as goals the seller has for customer thinking and adding actions the seller may take to achieve those goals and measures of their effectiveness. This model also adds a stage for customer feedback, important for product improvement and innovation. Defining the first step as problem recognition may imply the “problem” has an objective existence, independent of the customer—and the producer. Framing the decision process as problem-solving suggests the customer is a “rational actor.” The danger is that people often act more on emotion than by rationally calculating self-interest. And their definitions of problems depend on their point of view and are often formed in conversations with others—including producers. Indeed part of the innovation process is reframing an existing situation to create consensus around a new definition of a problem. >Models of decision-making as problem-solving echo models of the design process as problem-solving which were common in discussions of first-generation design methods. In proposing a second generation of design methods, Horst Rittel 5. articulated the limitations of design as problem-solving and offered as an alternative a view of design as conversation. Bitner suggests “trial” is the most important stage because it is influenced by customer readiness or the expectations that they bring to the interaction—can they do “it” (ability), do they know what to do (clarity), and do they see benefit in doing it (motivation). These ideas are consistent with the concept of transparency in interaction design. Of course, producers (and designers) have goals for their customers’ experience. But all they can do is provide artifacts and services that create opportunities for experience. We should be cautious about proposing to “design experience.” Ultimately, construction of experience remains with the customer. You own your experience. No one else can construct your experience for you. In John Dewey’s words, “a beholder must create his own experience.” 3. So: What is the customers’ view of their experience? 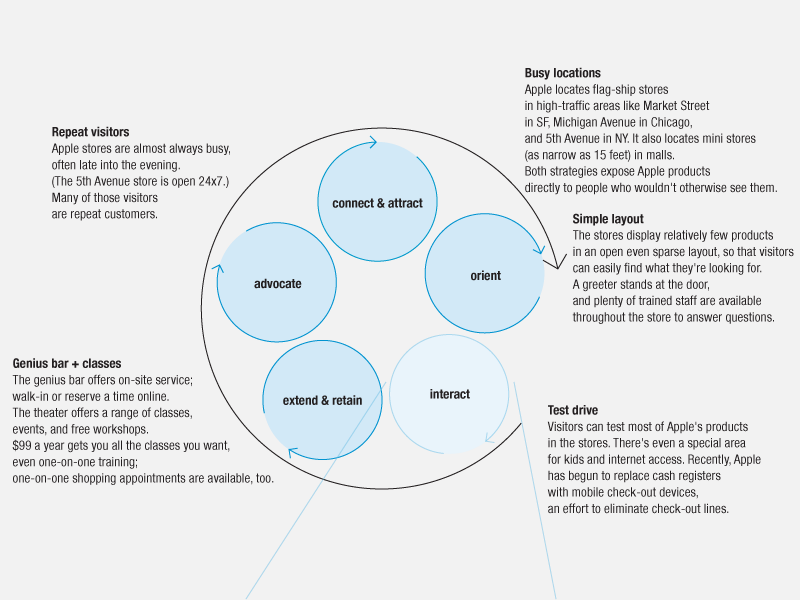 Customers interact with producers through “touch- points,” clusters of elements combined into artifacts that foster product or service experiences. 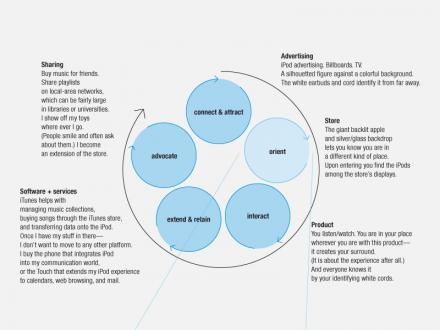 These touch-point experiences form a larger arc or path: the customer journey. 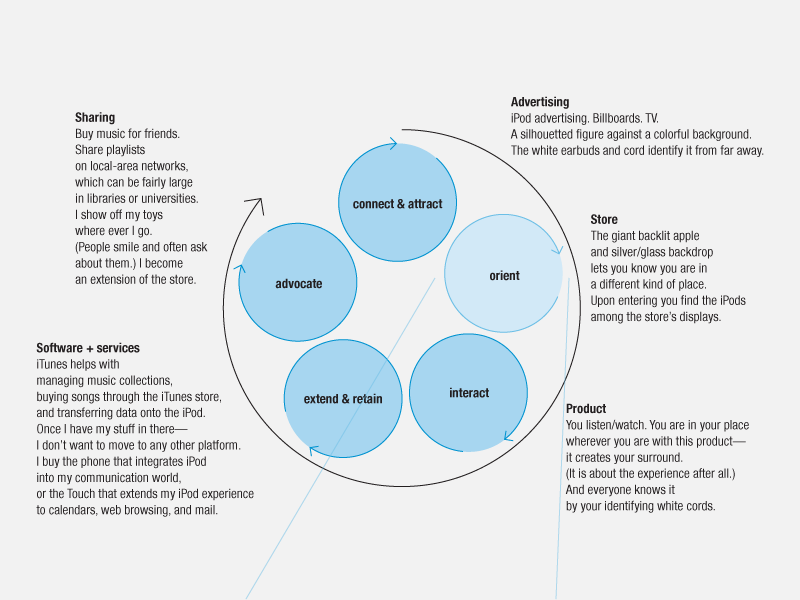 The series of customer experiences aggregate to form an impression of the product or service in its context—developing an idea of what it does, what it means, and what its worth—what the customer thinks of the brand. Indeed, the impression (the sum of the experiences) is the brand. 7. Ideally, the experiences build a strong relationship between customer and producer. John Rheinfrank, Shelley Evenson, and others developed a model of the ideal “experience cycle” as they worked on a usability design strategy for Xerox in the 1980s. They were searching for a way to describe a copier in its broader context—in its ecology—so that they could design the product to fit its context. The initial model had seven steps, but over the years the team refined it to five. 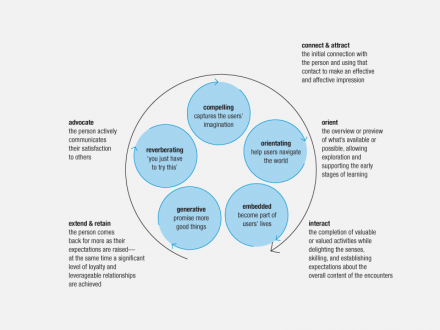 Explicit in the experience cycle is the process by which customers become advocates and introduce others to the product, beginning the cycle anew. This frame suggests a shift in focus from “the sale” as a point event or “trial” as a single interaction to nurturing a series of relationships in a continuous cycle that yields increasing returns. In Csikszentmihalyi’s concept of “flow,” people are completely involved in an activity for its own sake. In peak flow experiences, people are engaged in discovery, transported to a new reality. 2. Though in most experiences we cannot expect people to “become so involved that nothing else matters,” addressing the facets of experience can make flow easier to achieve. 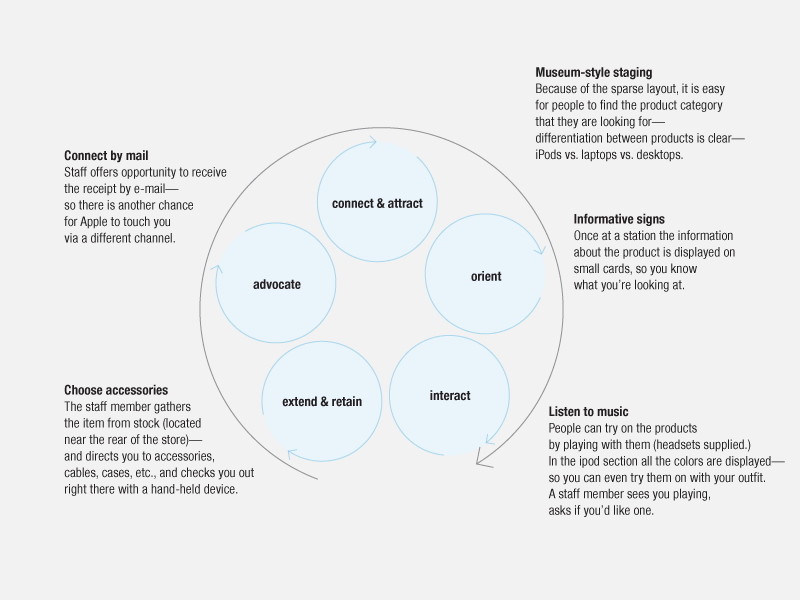 The experience cycle also helps designers reflect upon another important design consideration—what expectations people bring to the experience. At each stage, resources for experience must account for or consciously disregard a customer’s expectations for the stage and design accordingly. The experience cycle plays out at multiple scales. It plays out “in-the-large,” across the life of the relationship between a customer and a product. It also plays out “in-the-small,” across the experience a customer has with each touch point. For example, a good magazine ad connects immediately with readers, presents a clear structure, draws readers in, extends their knowledge, and delights them so much that they show it to other people. A good product package, a good interface, a good support service, and other well-executed touch points enable a similar cycle of experience. These interactions build on one another and further cement the producer-customer relationship. The experience cycle model suggests experience has a fractal quality—that experience has a self- similar structure at different scales. The model suggests recursion—each stage stands for itself but can also “call” the whole model. The recursion process can continue down to a ﬁ ne scale as designers work out the ways an experience ramifies. (Design also has a self-similar structure at different scales; employs recursion; and ramifies.) 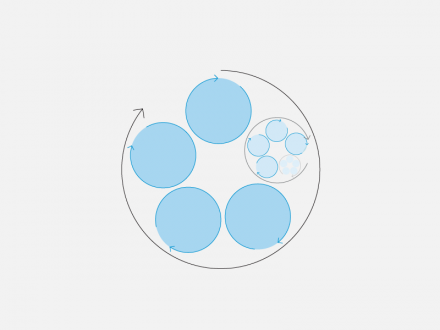 Thus the experience cycle model is useful to designers both in early stages of a project when working out the broad outlines of a product or service and also throughout the process as successive iterations add increasingly finer levels of detail. See an Apple Case Study of the experience cycle. I’m really inspired by The Experience Cycle. So inspired that I’ve been trying to use it (in an even more simplified form) to help plan user research efforts, evaluate UX, and even plan UX strategy and tactics. I was wondering if you have any additional examples of how this model is or has been applied. Also, are you aware of anyone else applying this model outside of DDO? I haven’t been able to find a lot of online response to the article yet. I would love to see how it is being used and share how I may be using it as a tool. I had the opportunity to hear Hugh present the Experience Cycle model. It really resonated with me for our company, which sells complex analytical instruments. It gave us an excellent framework we are now using to expand our focus to the entire cycle, rather than just the initial sale. It also made it very apparent where we were not devoting enough time or resources to developing the user experience to encourage the advocacy that will help the business grow. I love the cycle charts. I’m using it in my design classes. Thanks!